I remember that my sister and I really enjoyed this show in reruns. It seemed like we were a bit obsessed with TV shows of that era, we loved My Three Sons, Bewitched, and Brady Bunch too. I loved the doorknobs in the middle of the door, that must be what rich people have. All the spinning gems at the opening seemed so extravagant. Family Affair is an American sitcom that aired on CBS from September 12, 1966 to September 9, 1971. 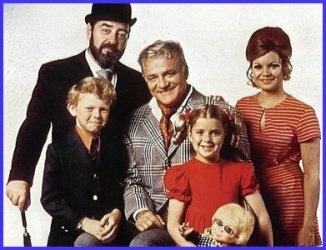 The series explored the trials of well-to-do civil engineer and bachelor Bill Davis (Brian Keith) as he attempted to raise his brother’s orphaned children in his luxury New York City apartment. Davis’ traditional English gentleman’s gentleman, Mr. Giles French (Sebastian Cabot), also had adjustments to make as he became saddled with the responsibility of caring for 15-year-old Cissy (Kathy Garver) and the 6-year-old twins, Jody (Johnny Whitaker) and Buffy (Anissa Jones). The show ran for 138 episodes. Family Affair was created and produced by Don Fedderson, also known for My Three Sons and The Millionaire. William “Bill” Davis, originally of Terre Haute, Indiana, is a successful civil engineer who develops major projects all over the world. A wealthy bachelor often dating socialites, he lives in a large Park Avenue apartment in Manhattan, and has a quintessential gentleman’s gentleman, Giles French. However, his quiet lifestyle is turned upside-down when his two nieces and nephew move in. Bill’s brother Bob and sister-in-law Mary had died in an automobile accident a year prior to the premiere episode. Their children, teen Cissy and her young twin siblings Buffy and Jody, had been dispersed among relatives in Terre Haute, but none wanted to continue raising the children, so they attempt to give the responsibility to Bill. “Uncle Bill” is not keen on the idea at first, but the children endear themselves to him. First Buffy comes along, followed by Jody, and finally Cissy. Initially mortified by the situation is Mr. French, who effectively becomes the children’s nanny, on top of his valet duties. However as time passes they all become a family, albeit an accidental one. When Sebastian Cabot became ill, Giles’s brother, Nigel “Niles” French (John Williams) was introduced, working for the Davis family for nine episodes in 1967 while Giles is said to be in England visiting the Queen. In the last season, Bill hires a part-time housekeeper, Emily Turner (Nancy Walker) to assist Mr. French. Various other characters were also seen regularly, including several acquaintances of Mr. French who are in service (most notably Miss Faversham (Heather Angel), colleagues of Bill, and friends of Cissy. As discussed by Kathy Garver on the final season’s DVD features, the show’s cast suffered several deaths. Anissa Jones died of a drug overdose in 1976 at age 18. Sebastian Cabot died of a stroke in 1977 at age 59. In 1997, two months after the suicide of his daughter, and having lived with cancer for some time, Brian Keith committed suicide by gunshot. In 2002, Gregg Fedderson died of cancer at age 53. Cancer also claimed the lives of Heather Angel in 1986 and Nancy Walker in 1992. John Williams died in 1983. Both Phil Ober and John Hubbard, who portrayed Bill Davis’ business partner, Ted Gaynor, are also deceased.